brown-headed Nuthatch boxes in our state this month. Our chapter contributed 240 to this number. Now it is time to get ready for another season. During the fall, the nuthatches will defend their territory and begin scouting for winter roosting and nesting sites. If you have not already done so, it is time to clean out your nest boxes so that these special birds will choose your box for their next home. “Seldom do wasps usurp boxes from nesting birds. They are mostly found in empty boxes. If these insects are found in a box, it is best to leave them alone and not take any active measures to exterminate them. Instead, wait to evict them until the fall when the weather is cooler and their activity has halted. "You can prevent wasps and bees from establishing themselves by applying a thin layer of nonstick cooking spray or bar soap onto the inside surface of the roof. This will create a slippery surface between the insects and the roof of the box. To prevent them from establishing colonies, keep nest boxes plugged until just before the breeding season of the target species begins. You may notice in the photo above that the wasp nest is not on the roof of the box. Treat the areas in your boxes that seem to be a problem. During our September Second Sunday Nature Walk on the Downtown Greenway, we spotted a few Butterfly Weed (or Butterfly Milkweed) plants that had been planted in one of the flowerbeds. 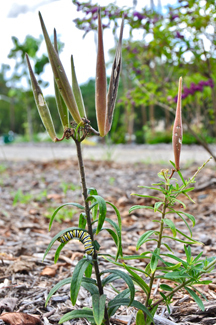 One of the young plants had a nice “candelabra” of seedpods (technically follicles) and a Monarch caterpillar. Several people have asked about collecting Butterfly Milkweed seeds for next year. Now is the time to do it. If the pods are turning brown and the plant is nearby where you can return to it easily, put a rubber band or a piece of tape around the pods to keep them from splitting and releasing all the seeds before you get back. If you aren’t likely to return to that site before the pods completely ripen, you can clip off the whole stems (with permission on private property) and put them in a vase with some water to finish ripening. Once the pods have ripened completely and show signs that they’re beginning to split along the vertical seam, remove them from the attached stem and store the pods temporarily in a paper (not plastic) bag to allow them to finish drying. At this point, take off the rubber bands or tape to allow the pods to open. Later when the pods have split and the seeds are emerging on their fluffy “parachutes ” (technically a pappus), give the bag several hard shakes to separate the seeds from the fluff. You’ll still have to separate some by hand, but you’ll save yourself some trouble that way. Make sure that you close the bag before shaking it and open it outside. Otherwise, you’ll spend additional quality time getting acquainted with the fluff all over your house. Butterfly milkweed seeds can be planted immediately outdoors. Be sure to put them where you want them to stay because they’re hard to move once the taproot gets started. This species of milkweed likes dry sunny places like open pastures and roadsides. It could be over-watered and killed in a typical flower garden. This same seed collection procedure can be used for Swamp Milkweed, as well. Swamp milkweed grows along stream and pond banks in full to partial sun. Its roots don’t have to be damp all the time. It does well in typical rich garden soil but will need to be watered frequently during dry spells. Several members have stepped into leadership positions over the past few weeks. Marie Dow has agreed to be membership chair. This is an important position for keeping track of new members, active members, and potential active members. Marie will also continue her duties at program meetings, cheerfully greeting arriving folks and giving out name tags. Many thanks Marie. Moving to the outdoors, we note that Jim Eldrett has taken on the role of Audubon Natural Area Steward. Jim has been informally working at the ANA for a couple years but now will be responsible for arranging trail maintenance days and for coordinating both the fall Big Sweep and the spring Great American Cleanup. He will also work to fix damaged informational signs and add more. Many thanks to Jim for undertaking this important chapter activity. We also want to thank Terry Woodrow who has agreed to coordinate the task of mowing the Tom Hillmer Trail in the sewer-line right-of-way. Terry has also been pruning overhanging branches to make walking the trails more enjoyable. Thank you Terry. Also due acknowledgement is Julien McCarthy for his past work at the ANA over several years, doing trail work and providing informational signage. Thanks Juilen. Gregg Morris has stepped down from the Pearson Board, and we thank him for his work with us, especially in getting signage for the Audubon Overlook. Nov. 21 (Sat) Field Trip: Guilford County Southwest Park with Forsyth Audubon Chapter. Thanks to Dennis Burnette for providing all of the images in this issue of Nature Notes. 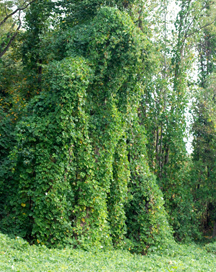 Kudzu is one of the more notorious non-native species found in the South. It and other invasives affect both wildlife and our local environment. Our speaker for the October program is an internationally known scientist with a background in forest ecology and wildlife management . His talk will give an overview of invasive plant characteristics, ways in which these plants became introduced, and the ecological consequences of plant invasions. He will then discuss implications of invasive species for birds and other wildlife. The presentation will wrap up with a discussion of plants that can be used as alternatives to non-natives in gardens and other landscapes. Dr. Moorman’s areas of expertise include habitat management for wildlife, avian ecology, and forest and urban wildlife ecology. He is well-regarded for his research in these areas and has an impressive list of publications covering topics from management for Northern Bobwhite and Wild Turkey to coyotes, small mammals, and salamanders. Please join us for this fascinating program about the “aliens in our midst"!! When: October 11th from 2-5 p.m.
Join us for a walk in the woods and enjoy the fall weather while exploring all areas of an old farm. Take time to see the newly constructed vernal pond for salamanders and the frog pond, which is critical habitats for amphibians. You will see old fields and pastures planted with native grasses and wildflowers creating Piedmont prairies that have all but disappeared, wander along the river trail, and go through many forested areas. A diversity of habitat provides a diversity of wildlife. Depending on the weather we hope to see arriving winter birds, fall migrants, butterflies, and other wildlife. The right of way on the property is being prepared for planting in the spring of 2016 with a diversity of short native grasses and forbs, which will add about seven more acres of prairie. 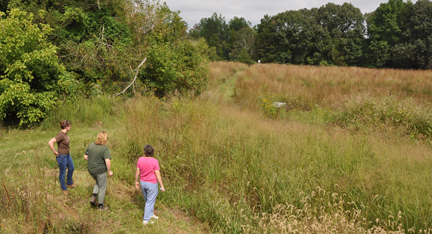 During the preparation for planting native prairies, site analysis is critical so that non-native invasive species can be controlled to improve success. We will provide several experts to take small groups to different areas to focus on specific interests. You may join the guided tour or, with a map, take a self-guided tour. 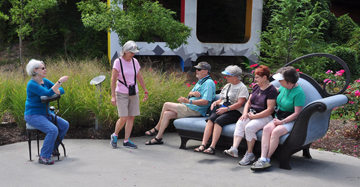 The walking tour is a moderate walk, but be sure to bring water, bug spray, and good walking shoes. For those carpooling, meet at Friendly Shopping Center in front of Whole Foods under the Sears Plaza sign at 1:30 p.m. For those driving directly to the property, please arrive at 2 p.m. The address is 1111 Bales Chapel Road in Jamestown. There is plenty of parking, which will be marked. You may contact Marie Poteat at 336-491-8454 or Marie.Poteat@gmail.com. 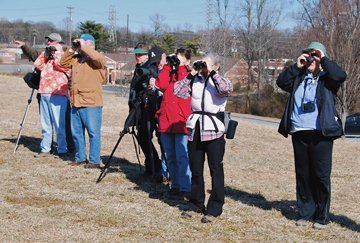 This season TGPAS will present three separate workshops for beginning birders. Dennis Burnette, a retired college professor, a nature educator, and an amateur wildlife photographer, will be the presenter. Dennis is past president of T. Gilbert Pearson Audubon Society and a current member of the TGPAS board, past president of Piedmont Bird Club, and a past vice president of the Carolina Bird Club. The topic of each workshop will differ. Each will stand alone, meaning that a participant may attend one, two, or all three and receive different materials each time. Each workshop will involve a 45-minute classroom presentation and discussion followed by 45 minutes of practicing skills outdoors. Members of TGPAS, Piedmont Bird Club, and the general public are invited to attend. Oct. 18, Sunday, 2:30-4:30, KCE Family Branch Library, “How to Get Started Watching and Identifying Birds.” This workshop will be an introduction to birds and birding beginning with a 45-minute class, followed by bird identification practice around the library. March 20, Sunday, 2:30-4:30, KCE Family Branch Library, “Familiar Birds of our Lawns and Parks.” This workshop will include a 45-minute class focused on building bird identification skills followed by a bird walk in Price Park. May 15, Sunday, 2:30-4:30, KCE Family Branch Library, “Attracting Birds to Your Back Yard.” This will be a workshop about bird feeders and bird food followed by observation of the bird feeders around the library. TGPAS will team up with Forsyth Audubon Society (FAS) on Saturday, Oct. 24, for a bird walk in Tanglewood County Park in Forsyth County. This will be the first of what we hope will be several joint activities involving our two Audubon chapters. Forsyth Audubon has been involved in many projects in Tanglewood to make it a more bird-friendly site. We will explore one of the latest ones, the Yadkin River Nature Trail, that FAS has developed as a nature trail with interpretative signage. The trail opened officially recently, in June 2015. Rob Rogers, the FAS president this year, sent us the following information in an email: Upon arriving at the park sign, take the first left onto Northtrail Road. Follow Northtrail to the parking area across from the dog park. Forsyth Audubon plans to leave some cars there at the parking lot and carpool in. There is a nominal fee of $2 per car, so be prepared to help share the cost with your driver. Once in the park, we will drive to the area where FAS has installed the interpretive signage. The walk will be a leisurely 1.5 to 2 miles on typical Piedmont terrain with some ups and downs but no hills. The trail will have rocks and roots but shouldn’t be greatly challenging. Be sure to wear sturdy walking shoes and bring plenty of water. After the bird walk, we plan to adjourn to a nearby restaurant for lunch and fellowship with the FAS folks. Folks in Greensboro will meet for this field trip at 8 a.m. at our usual rendezvous place, the Whole Foods Market parking lot in Friendly Shopping Center next to the Sears Plaza sign. We’ll organize carpooling at that point. Our intent is to leave shortly thereafter to arrive at Tanglewood at 9 a.m. where we will meet our guides from FAS. We expect to be back in Greensboro by around 1:30. For those who wish to go on their own, Tanglewood County Park is located at 4061 Clemmons Road, Clemmons, NC 27012. Our first Second Sunday Nature walk of the new program year was on an unusually cool, sunny day for the 13th of September. Tom and Stella Wear had scouted the route earlier in the week with Jack Jezorek and were very able leaders of the outing. Our destination was the new Downtown Greenway, which we had heard described along with photos in our first meeting of the season the previous Thursday. The portion that’s open certainly lived up to our expectations! When it’s completed, the greenway will form a rectangle around downtown Greensboro. It already has sculptures and landscaping along the paved route, and there is much more to come. We walked a little over a mile out and back to the parking area, then drove to another small section that has been completed to see the sculptures and the “urban orchard” that’s been planted. Mid afternoon in a paved urban setting isn’t the best time and place to see and hear birds, but we did note a few, including American and Fish Crows, American Goldfinch, and Turkey Vulture. Actually we saw more butterflies than birds on the many plantings along the route. We encountered 8 species of butterflies, counting the Monarch butterfly caterpillar we spotted on a milkweed that had been planted in the urban orchard. The Downtown Greenway is a great resource for our community. No doubt TGPAS will return in the future as more of the route is completed. Besides the wonders of nature to be found all around the park, the headline above also refers to the information displays recently installed by TGPAS in the kiosk along the hiking trail by the tennis courts in Westerwood. We have partnered with that neighborhood on several projects over the years. One of those is the Bluebird trail along North Buffalo Creek. Audubon installed the nest boxes, and, under the guidance of Barbara Hughes, Westerwood neighbors and chapter members monitor the family-raising success of the birds. More recently the chapter installed two nest boxes for Brown-headed Nuthatches, a bird whose numbers are declining due to a number of factors, not the least of which is lack of nesting places. One side of the kiosk has information posters which celebrate both the Bluebirds and the Nuthatches, and some amazing photos of these birds. Another project of both the neighborhood and TGPAS is to encourage the greater use of native plants in our home landscapes and in our parks. Both groups are working with the city to do just that. Native trees, shrubs, and flowers are good for both pollinators and birds, both of which suffer in landscapes with mostly exotic plant species, as the birds, bees, and butterflies do not recognize these alien species. The other side of the kiosk display has information that explains this idea more fully, as well as some beautiful pictures of plants and critters. So the next time you are walking or biking along the bike path stop and take a look at these displays. You might just decide to help Nuthatches by installing a nest box in your yard, to sign on to be a monitor, or to use some native plants in your yard. Many Westerwood neighbor names were left off the article in the last issue of Nature Notes. Thanks to Barbara Hughes for coordinating the project and providing the following list of Bluebird box observers: Betty Godwin, Stephanie Berry, Paola Rowe, Caroline Rowe, Patrick Rowe, Donna Allred, Steve Cole, Roxy Ulmsten, Josi Ulmsten, Martha Hughes-James, Griffin James, Jan Llosky, Julie Dossey, Ellie Dossey, Shane Dossey, Debby Seabrooke, Lyda Carpen, Jim Stinson, and Sue Stinson. Special thanks go to Griffin James, the volunteer who kept the hops and other troublesome weeds mowed around Box No. 3 beside the Garland bridge. Which, by the way, is the most active box in producing Bluebirds. Another bit of trivia: The boxes were checked for 25 weeks in 2015.